Every winter I wake up feeling like I’ve been gargling with gravel. My skin feels itchy and dry and my lips are painfully chapped. How can this be? I follow a nightly moisturizing regime, I drink plenty of water and try to get a healthy sleep pattern. Yet in the winter months, the air can seem so much drier, mainly due to use of household heating systems. It was even worse when I lived in a desert climate for a while, with an unrelenting lack of humidity. Higher heat means less moisture in the air, and less moisture means the possibility of dry skin. The best humidifier for dry skin will provide a simple solution to solving those woes, but choosing a humidifier can be a challenging task. Do you go for a full home system that’s incorporated into the heating or air-conditioning system? (Expensive to install and costly to repair.) Or do you choose to follow the more convenient and less expensive option of a mobile humidifier that you could even take to the office to beat that powerful AC unit? Ultra quiet at 38 decibels. Timer function to set humidity level from one to 24 hours. UV Light technology for germ-free moisture. Wicking filter in water tank. Stylish and whisper quiet unit. Warm or cold mist increases humidity 25 percent quicker than cool mist only. Built in humidity meter with sensitive touch control and remote control. Large 6-liter capacity allows for 20 to 36 hours of continuous use. Compact and ultra quiet operation, won’t distract you from office work or sleep. 3-liter tank with automatic turn off. Unique stylish wood grain design. Great mist output for up to 10 hours of continuous use. Do You Really Need a Humidifier for Dry Skin? As we get older, it becomes increasingly harder for our skin to retain moisture as we produce fewer oils. Heat, cold, harsh soaps and shampoos, frequent washing and exposure to the sun all take their toll on our once youthful skin. Epidermal cells that were previously plump shrivel up and leave rough, scaly and itchy patches of skin on your body. In more severe cases this insufficient moisture can cause the skin to crack and bleed. As we spend the majority of our time indoors, increasing the humidity in your home or workplace will relieve many of the symptoms of dry skin. The American Osteopathic College of Dermatology recommends using a humidifier to keep a humidity level between 45 and 55 percent, especially in what they refer to as the ‘central heating season’. During the fall and spring most homes in the U.S. maintain a good level of humidity and humidifiers aren’t recommended for running all year round (although air-conditioning units may also cause a lower relative humidity). The best humidifier for dry skin will quickly and easily add moisture to the air, and by sleeping with a humidifier on you’ll wake up with moisturized skin. Immediate effects you’ll notice will be your skin looking more supple and your hands and lips won’t feel too dehydrated. Sometimes running a humidifier alone won’t cure or prevent all dry skin although it’ll certainly help. In the following YouTube video a doctor recommends ways you can prevent and treat dry skin. With many different humidifiers available serving very different purposes it can be tricky picking out one that specifically helps with dry skin. To help you choose the best humidifier for dry skin we’ve looked at some of the best-selling humidifiers that aim to prevent dry and chapped skin. Noise is something you won’t have to worry about with this quality humidifier, it levels off at 38 decibels that even a baby could sleep through. A 4-liter water capacity provides approximately 15 hours of adjustable humidification for moisture that’ll last into the night. A microporous cartridge filters the water to get rid of microorganisms for odorless and purer air. An adjustable vapor allows you to set the humidity level and mist flow for rooms up to 40 to 50 square meters to combat dry skin, chapping and winter cold. The built-in timer, intuitive LED display, sleep mode and a 360 degree nozzle give you full control over the humidity of your environment. The built in LED displays the current humidity level and other modes of operation. Cartridge system purifies the water used for mist. 360-degree nozzle allows humidifier to be placed anywhere in the room. Easy to fill with two handles for lifting. Only offers 15 hours use. Control system requires lot of button pressing. Design with filter means it occasionally gurgles air bubbles rather loudly. From one of the best known humidifier manufacturers, this model is one of the most popular on the market. A sleek stylish unit, available in either black or white, the quiet operation makes it ideal for bedroom use. Three speed settings allow you to adjust moisture and sound level, with a single tank providing up to 24 hours use on low setting. 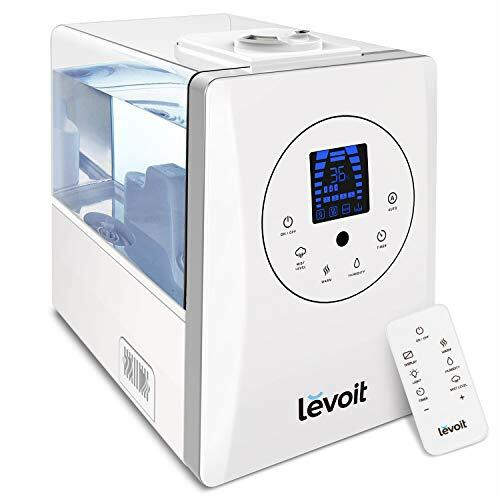 The main feature of this humidifier for people wishing to avoid bacteria, fungus or mold in the water tank is the ultraviolet light technology, that ensures the moisture emitted is virtually free of germs. A wicking filter removes impurities from the water to reduce the white dust you sometimes experience with humidifiers. A Protec antimicrobial ball in the tank prevents mold growth on the filter. Up to 24 hours from one tank of water. Sleek design and quiet operation makes this humidifier almost invisible. a disinfectant that some customers can be sensitive to. Must replace filter regularly for efficiency. Don’t use essential oils in tank as it voids warranty and clogs up machine. A few reported cases of leakage. This humidifier alternates between warm and cool mists with built-in smart technology automatically diffusing mist to adjust humidity to the most suitable level. An intuitive control panel and remote control allow you to set the mist level, timer and warm or cool mist functions. A display allows you to monitor the humidity around you with customizable humidity enabling you to program a humidity level of anywhere between 40 and 80 percent. The water tank material has been updated to ABS plastic which rarely breaks with a special leak-proof design that’s different to many other leaking humidifiers on the market. A two-year warranty and lifetime support guarantee should put your mind at rest when splashing out the little extra for this beast of a humidifier. Whisper-quiet operation at less than 36 decibels. Warm and cool mist with smart auto mode. Easy to use with large display. Customers complain hygrometer isn’t accurate making auto mode unreliable. tank and replacing it difficult and often messy. Display can be very bright especially when used in bedrooms. This is one of the smaller units we’ve looked at, but still has a respectable 3-liter water tank. At this size it could be taken to work with you and even on high mist setting will last all day long or up to 12 hours. In smaller rooms, like the bedroom, on the low mist setting it’ll produce enough air moisture for 24 hours. 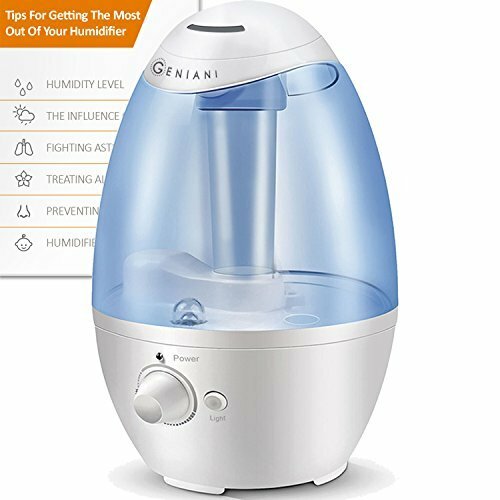 One of the quietest humidifiers for dry skin, the Geniani humidifier also comes with a night light to promote better sleep and a 360-degree mist nozzle that spreads the mist in two directions at once if required. A two-year warranty, with service agents across the country, make this a risk-free purchase. Extremely quiet so won’t disturb your sleep. Small unit with respectable 3-liter tank for longer lasting moisture. Some customers complain it's hard to fill. Can be difficult to clean tank due to design. Moisture setting doesn’t go low enough for many customers. 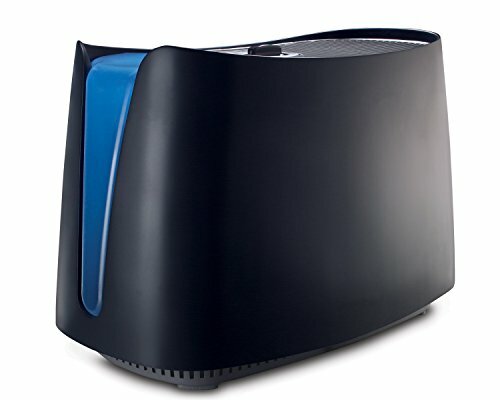 What make this stand out from the other humidifiers we’ve looked at is its unique beautiful design that wouldn’t look out of place in a quality spa. Portable enough to take to the office, yoga studio or use at home, the 300-milliliter water tank provides 30 milliliters of moisture per hour. An adjustable LED light allows for seven colors in two modes, steady on or changing to create a more relaxing atmosphere. Four time setting modes, one hour, three hours, six hours or constantly on combine with an automatic power off when water is used up for maximum safety. 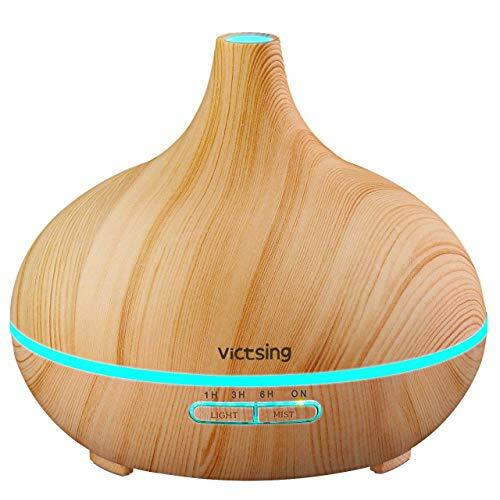 With adopted ultrasonic technology for quieter performance, this humidifier gives out an ultra fine mist that can soften and moisten dry chapped skin in the winter. This stylish humidifier may also be used as an essential oils diffuser. Ultra stylish and adds to decor of your home. Fine cool mist is great at softening and moisturizing your skin. Very quiet and LED light ring is found to be quite soothing. Small tank will constantly need topping up. Durability issues with many customers disappointed by lifespan of unit. Mist can be too minimal for some. When choosing which was the best humidifier for dry skin, it was a very tough decision. All the products we’ve looked at will certainly help with dry skin issues and other health problems. They were all quiet in operation, the last thing you want is a noisy fan sound in the house, especially when trying to sleep. 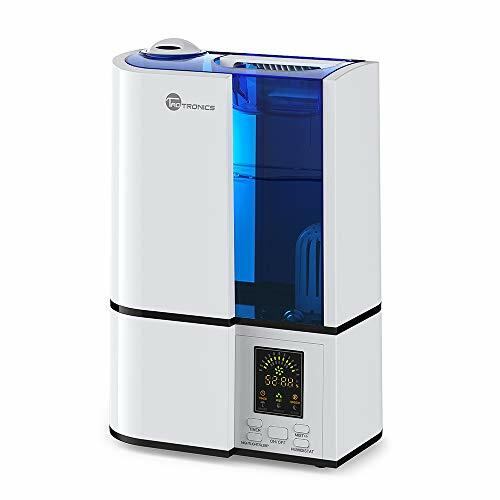 Although it was very close between the top two models, in our opinion the TaoTronics CoolMist Humidifier is the best humidifier for dry skin you can buy today. It might only hold four liters of water and operate for 15 hours, but the rotating nozzle, variable humidity ratings and value for money it offers make it a hard humidifier to beat. What Is the Best Korean Moisturizer in 2019?